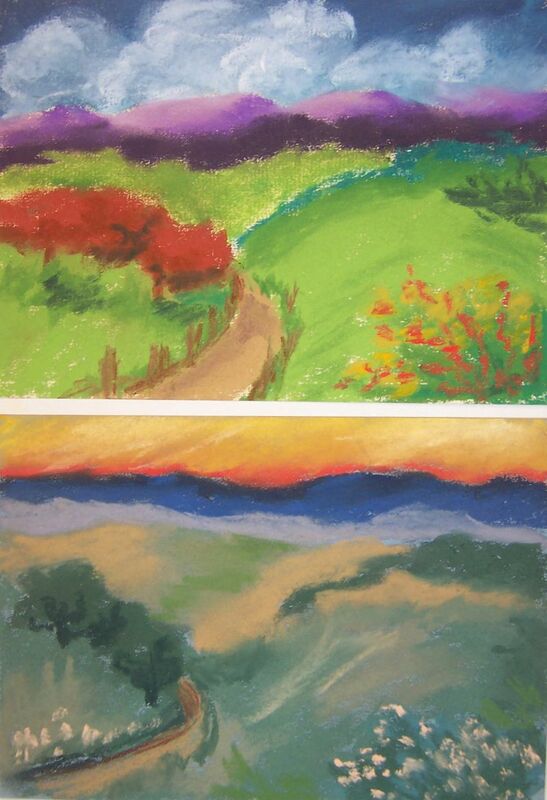 This time, I made things different by putting my hand on a pastel and then moving to another. Weird, but that’s what the challenge is all about. 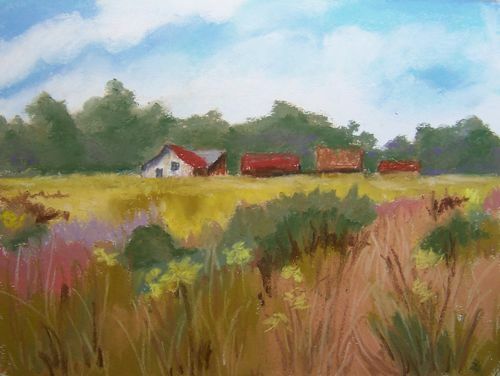 This is the weekend for the Lakewood Artist Guild’s Spring Show. 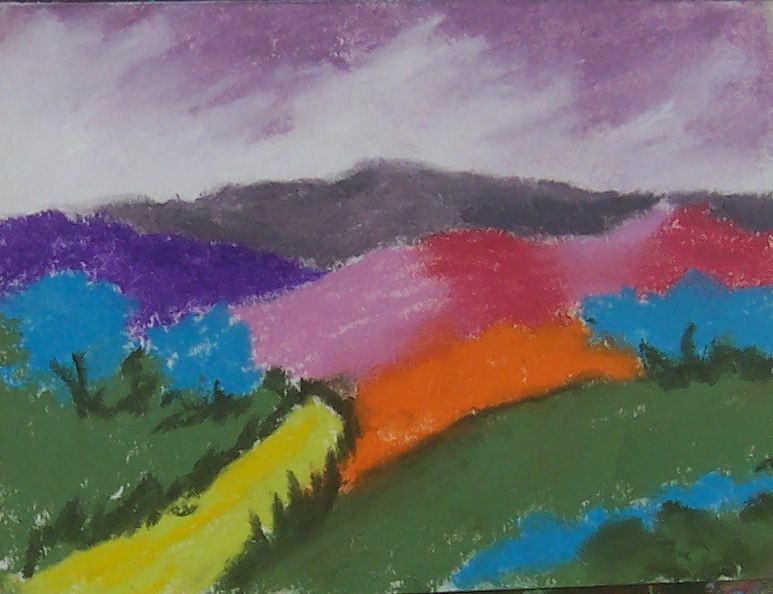 I will be entering 2 pastels. Less than previous years, but it’s been a busy time and I decided to take the stress off. 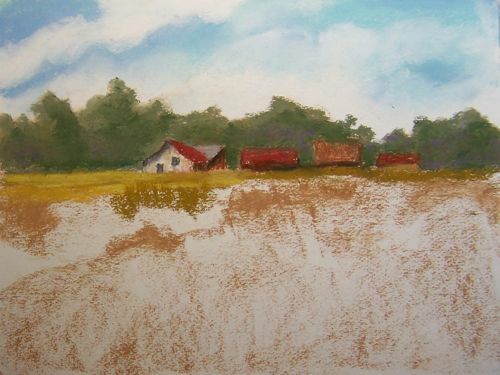 They only have separate categories if there are at least 7 paintings in the same medium, such as watercolor. If there are fewer than 7, then those are all lumped together in a general category. 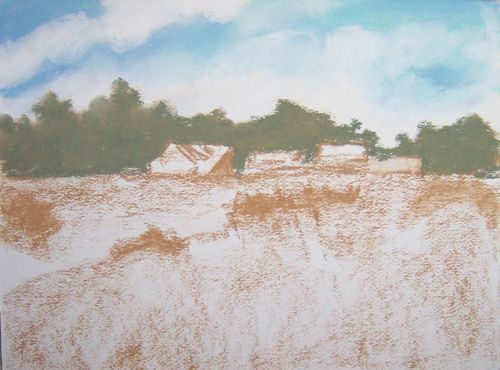 In past years, there have always been fewer than 7 pastels, so I get judged along with drawings, mixed-media, etc. We’ll see what happens this year. Pastel is becoming more popular across the country, but I’m not aware of anyone in the guild besides myself that works in it on a regular basis. Must make decisions hard for the judge! Thought I’d try to get another one done before getting some pastel paintings framed for the Lakewood Artist Guild’s Spring Show this weekend. Maybe I can get the 100 finished before the Fall Show. What do you think? 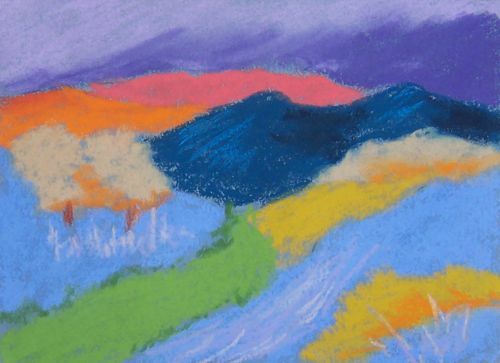 In this one, I picked up a box of various pastels that I had been using to complete a larger work and limited myself to what was in the box. 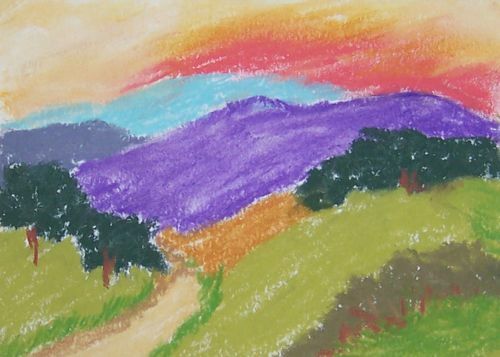 Remember, the goal is to use colors other than one’s we are used to picking up in order to get out of our ruts. This one sort of does that. Enjoy! Yes, it’s time to get back to the challenge. This is pastel #71 and I WILL finish 100 in 2012! For those new to this blog site, I joined a challenge quite a while back that was on Wet Canvas. The idea was to force yourself out of the rut you “may” be in of using the same colors for the same or similar objects. We set our own rules and went to work…..well, most of us….well, some of us did. I think I took a break around 50 or so. Anyway, my rules were that all pictures were to be 5 X 7″, done within 30 minutes with each one being different in some way. If you look back on earlier postings, you’ll see some very strange landscapes, but that was the whole point. This one was not so different, telling me that I need to get back to working with unfamiliar color schemes. I hope you enjoy the trip! 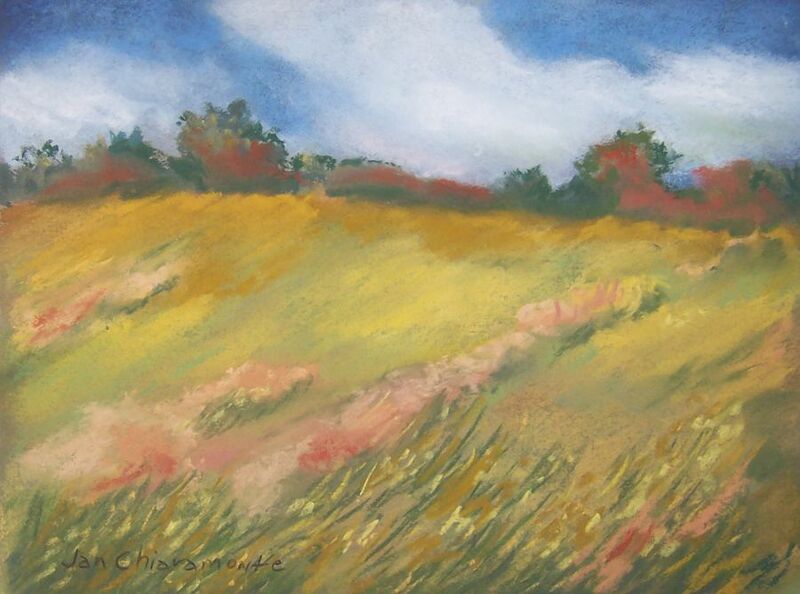 This is a 9 X 12″ pastel on Fabriano paper. It’s been awhile since I’ve done a process study. I hope you enjoy seeing the steps to the finish. 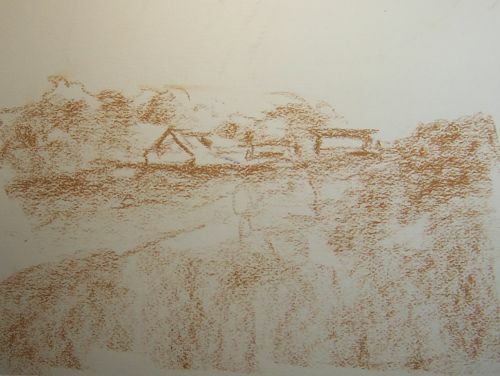 I usually start with a rough sketch in a neutral color to decide placement of objects, etc. Next I work on the sky. I know a lot of artists leave the sky to the last, but, for me, it sets the tone of the scene. Now it’s time o start adding color and painting the objects. I always work top to bottom and then later go back and add or change the interior items I’m not satisfied with. 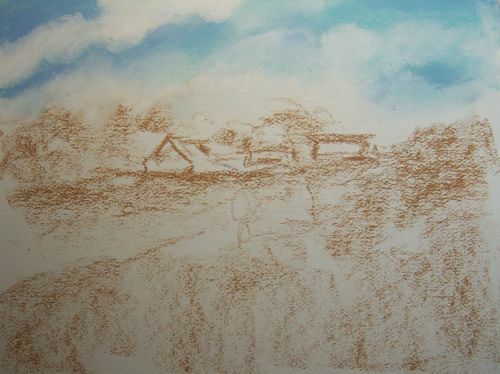 Finally, the bottom half is completed and any corrections are made…..actually, I made several to the buildings! As usual, any comments are more than welcome. I think I’d like to spend a little time at this farm. For newbies, I must explain that I joined a pastel challenge (a loooooooong time ago) that was started on Wet Canvas. The idea was to design a small picture of any type (landscape, still-life, etc) and complete 100 versions of the same picture each using different colors. The idea was to loosen up and stop grabbing the same colors all the time. We were to set our own standards and go to it! Mine are 5 X 7, and must be completed within 30 minutes. This one was fun because each time I reached for a color, I put it back and choose nearly the opposite. You’ll find the other 69 at various spots in the blog. Sometimes I get tired of doing them and drop it for awhile, but I’m committed to finish!! Well, it looks like I’m getting there slowly by surely! 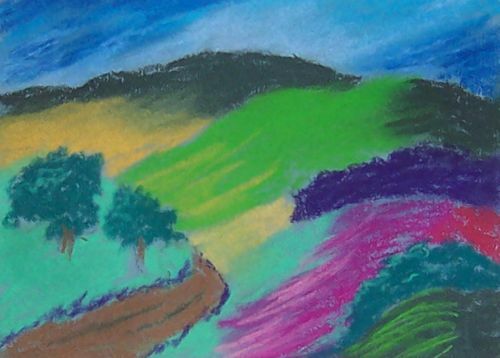 This may look strange to those who haven’t been following the blog long (and I’ve been gone awhile), but what it represents is a challenge that was made on a pastel forum on Wet Canvas (so long ago, I’m embarrassed to say). 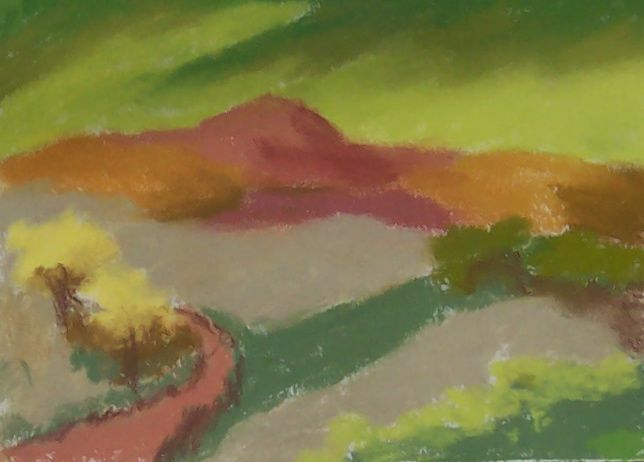 The idea was to loosen up by doing small pastels very quickly and purposely choosing colors that you wouldn’t actually use if you were going for the best. We set our own perimeters and mine were 5 X 7, done in 30 minutes or less. I have to say it is fun to pick out a color that makes you groan and then use it. If you scroll down through the blog, you’ll see what I mean. Now, since I’ve taken so long to do this (I’ll usually do 3 or 4 and then go back to normal painting, I think I may have miss counted. I have all of these 5 X 7s taped onto large cardboard sheets and out of the way of little dogs, etc. But, I’ll check them all before I raise the flag!! 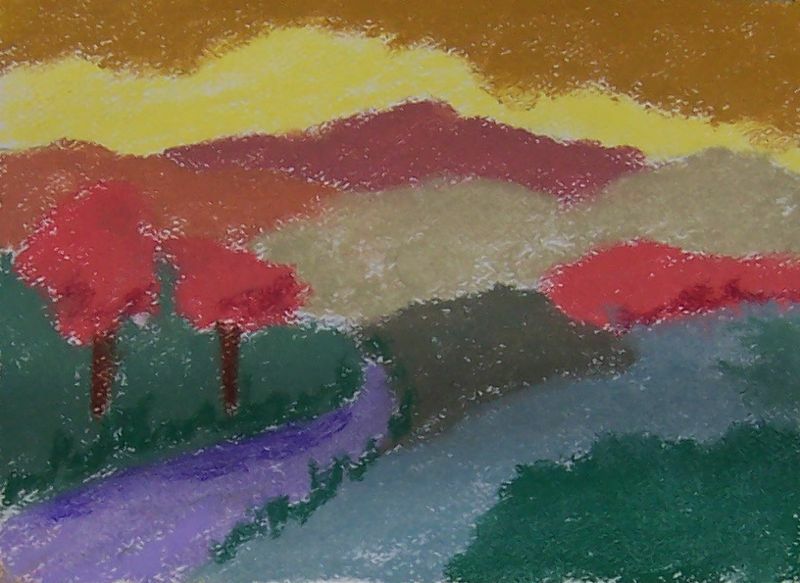 I just realized that I haven’t been working on the 100 Pastel Challenge lately. So, here is #66 & 67. I think I’d better get going to finish in 2012. What do you think? Well, as you can see, I’ve made a few changes to this pastel. 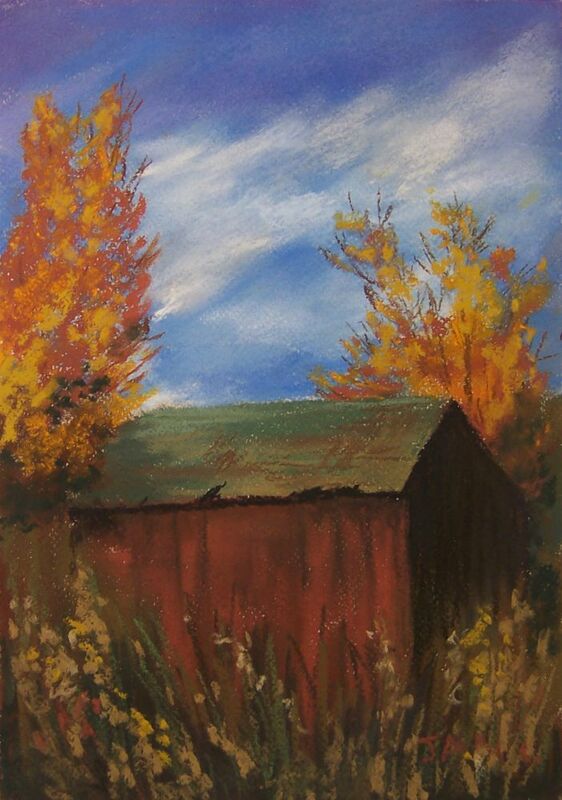 I really felt that the bottom needed more attention and that the color sets off the barn much better. Since this is a process blog, I can’t promise this is the final version. I always have to live with paintings for awhile to truly feel satisfied. The danger, of course, is going to far. But then, that’s what learning is all about, isn’t it?